Wednesday, March 2, 2016 • 7:00 p.m.
On June 27, 1976 Air France Flight 139 was hijacked and diverted to Entebbe, Uganda. Foreign passengers were freed while Israeli passengers were held hostage; to be killed if 40 Palestinian militants prisoners were not released in Israel. In response, Israeli intelligence and Special Forces launched a daring covert rescue raid in the dark of night. 100 commandos flew 2500 miles over enemy airspace miraculously rescuing 102 hostages and killing all the hijackers - all in 90 minutes. 4 individuals (1 Israeli soldier and 3 hostages) were tragically killed in the mission. Operation Entebbe's dramatic story has since been made into a number of major motion pictures. Sasson (Sassy) Reuven is a veteran of the IDF (Israeli Defense Force). As a member of elite "Red Beret" paratrooper unit, he participated in the famed "Operation Entebbe" and several covert operations against Arab terrorism. 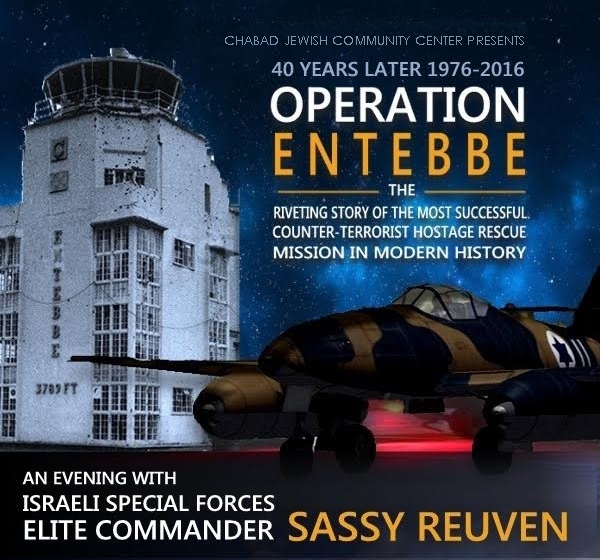 Sassy currently lives in Calabasas and engages audiences around the world in his first-hand account of "Operation Entebbe" - the tale of endurance, courage, defiance and self-sacrifice for the right to live in freedom.